Wow. I don’t even know where to begin. So much has happened since the last time I posted. All good things, promise. I owe you a vacation update, but there are a few, more important, matters to mention first. Namely, interviews and quesadillas. While I was packing last Friday for vacation, I received a phone call from a potential employer about setting up an interview. Great timing right? So I gave them my first available time after we got home which was 9am today. No way better to dive back into the real world (and frigid temperatures) than to go on a job interview (in 2 degree weather) 18 hours post-vacation! I think the interview went well, not my dream job but I think it’s something I’d enjoy. So we’ll see what happens. Spread Neufachatel cheese on one tortilla. 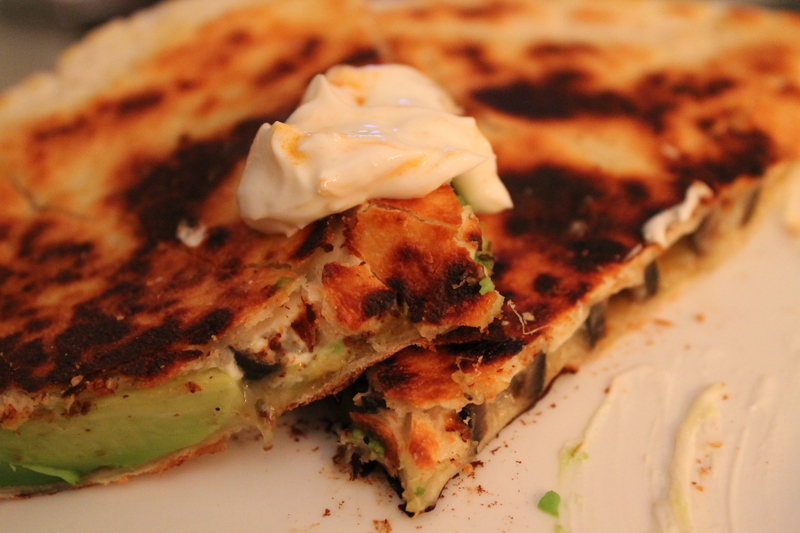 Top with shredded quesadilla cheese. Add cubed avocado and black olives. Sprinkle cumin, oregano, garlic powder, crushed red pepper, salt, and pepper over entire tortilla. Heat a medium or large skillet over medium low heat and spray with olive oil spray. When olive oil begins to sizzle, add tortilla with cheese, avocado, black olive, and seasonings on it to the skillet filling side up. Place the second tortillas on top and lightly press down. Cook for a few minutes, pressing top tortilla shell down until cheese begins to melt. In the meantime mix Greek yogurt and taco sauce together in a small bowl. Flip the quesadilla (I used tongs and a spatula for support) and let the other side cook for another minute or two. Transfer to a plate and cut into triangles with a sharp knife. Top with Greek yogurt taco sauce and serve warm. Pretty simple, and really yummy. How do you fill your quesadillas?